The United Sates Anti-Doping Agency (USADA) announced today the decision of an independent three-member arbitration panel from the International Court of Arbitration for Sport (CAS), the highest court for sport. The CAS Panel confirmed the lower court’s decision and imposed a two year suspension on Tyler Hamilton of Boulder, Colo., one of the top contenders in the 2004 Tour de France and the gold medal winner in the time trial at the 2004 Athens Olympic Games, for committing a doping violation. In reaching its decision the CAS Panel considered a number of Mr. Hamilton’s theoretical explanations for the positive test result including a disappearing twin, unsubstantiated problems with his positive test results and even an extortion plot by a fan of another team. A transfusion of another person’s blood is a prohibited method under the USADA Protocol and the UCI Anti-Doping Rules, which adopt the World Anti-Doping Code and the World Anti-Doping Agency’s Prohibited List. This form of blood doping allows a person to increase their red blood cells, thereby increasing their aerobic power and endurance. Hamilton tested positive at the Vuelta de Espana on September 11, 2004 and forfeits all competitive results received from that date. His period of suspension ends on September 22, 2006, two years from the day the CAS Panel found he was provisionally suspended. 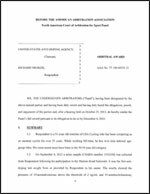 Union Cycliste Internationale (UCI) initially referred the case to USADA for handling. UCI joined USADA as a party in the presentation of the case when Mr. Hamilton appealed the initial arbitration decision. USADA is responsible for managing the testing and results management process for athletes in the U.S. Olympic and Paralympic Movement. USADA is equally dedicated to preserving the integrity of sport through research initiatives and educational programs.